When you work in the theatre, you often have to create elaborate illusions. Truly gifted artists work magic. I recall hearing about an actor who could change from Dr Jekyll to Mr Hyde right on stage, in front of a live audience, and make it convincing. Now that’s great acting! I worked special effects for several shows. I worked on several shows where we had to create homes, cars, fountains that had real water in them, window seats big enough to fit a person in and even alien spaceships. 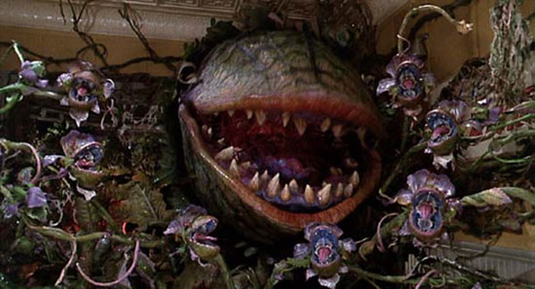 The biggest special effect I ever helped to create was the full-sized Audrey II plant for Little Shop of Horrors. That was both big and intricate. The plant had to accomplish a number of effects. First, the jaw had to be articulate. It had to be big enough for a person to fit inside, and it had to have enough room for a person to operate it, which essentially meant it had to be big enough for two people to fit in! That’s big. There was also a weight issue. Now, the lower jaw just sat on the stage, but the upper one had to lift up to move in sync with the voice being spoken and sung by the actor off-stage providing the voice via a microphone. Yeah, there was no way I could do the voice, I’d have been huffing and puffing and panting like a greyhound that had just run a race. Thus, the upper jaw had to be as light as possible; otherwise, the operator would be exhausted before the finale. Keep in mind, not only was I lifting the jaw, but I was in a small confined space under hot lights. It was like a steam bath in there! I think I drank about a gallon of water every night, never had to go to the bathroom and lost ten pounds by the time the show ended. Yeah, a great weight loss program. Then there was one other little detail. The cast members eaten, by the plant, had to exit, the plant, unseen by the audience. Here’s how it went down: I would open the jaw, the actor would crawl in. Then I started “chewing” on them by raising and lowering the jaw. They then had to crawl further in, get around me as I kept lifting and moving the jaw. Then they got out the opening in the back. From there it was simple. We had a hole in the set that allowed them to get backstage. The whole effect was quite good. On more than one occasion, after a show, we would have people in the audience stay, until most everyone left, to ask how the plant worked. Most times, it was a parent telling us that their child was confused as to what happened to the actors. The little girl was too sharp. She pointed out that she’d seen them at the curtain call. She just wanted to know how they got from the plant to the stage to take their bow. We showed her. It always made me happy to see people so curious about how things worked in a live show. It meant we had done our job in creating something truly memorable.